Makes refinishing wood floors quick, affordable and painless! There is no mess to clean up, no odors and service is complete in just hours. Everything we use is kid and pet safe. Serving all of Long Island. Featured On HGTV, Certified Green. Our kitchen floor has taken a lot of abuse over the years, and we wanted to make it look shiny and new again without replacing it outright. At first we tried to learn how to do this ourselves, by watching home repair videos on YouTube. Eventually we just gave up on the idea; it seemed like so much work. And a lot of mess too. Instead we called in Mr. Sandless flooring company. They were able to complete the entire task between noon, when they showed up, and three o'clock in the afternoon. And I don't mean just the refinishing, but also the cleanup and everything. They were literally out the door again within three hours, and we were looking at our floor, shiny and new. What a great service, and at such a low rate! Try them out! Mr Sandless is a great furnishing company. Sure enough, the solutions they use are cost effective, pet and child friendly, and wonderful to have. Plus, the salesmen are friendly and make sure you are satisfied with the end product! If I need their services again, I’d stop by definitely. They could be a little responsive though! Between the pets and the kids, I don't know which is worse, our hardwood floors really take a beating. 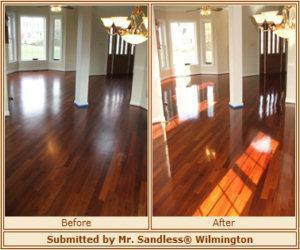 We clean them and polish them all the time ourselves, but Mr. Sandless does a much better job. When Mr. Sandless is done, the floors look like they were just installed. I saw this company on HGTV and knew that I could trust them to make my hardwood floors look great again, despite the efforts of my young ones to prevent that. Once they were hired I knew my decision was a smart one. My floors look incredible and all of the team worked together to get things done. Prices were more than affordable, and the quality is outstanding. This company will definitely get my call again in the future. We have hardwood floors throughout our home, and over time they wound up getting scuffed by the kids’ cleats, them not taking their shoes off when they come in from sports. So we decided we wanted to get the floors fixed up to look nice, because resale value is a big priority with me and my wife. The guys over at Mr. Sandless really knew their stuff, and did a great job making our floor look good as new. They use some self-made refinisher that really brings the shine and color depth back to the wood. Will use again in the future. These guys knew there stuff from start to finish about fixing & polishing my wood floors. I used them for my current residence as well as my rental properties and they really know how to turn an old wood floor into something out a magazine. Do you have any experience using Mr. Sandless? If so, please rate your experience and let others hear about it using the form below.